Heat oven to 375°F. Spray 8-inch square (2-quart) baking dish with cooking spray. In large bowl mix apples (peeled and sliced) with berries. Add granulated sugar, cornstarch orange peel (grated), and orange juice; toss until coated. Spoon into baking dish. In medium bowl, mix remaining ingredients, cutting in butter with pastry blender until mixture is crumbly. Spoon evenly over apple mixture. Bake 50 to 60 minutes or until topping is golden brown, apples are tender and mixture is bubbly around the edges. Cool slightly before serving. 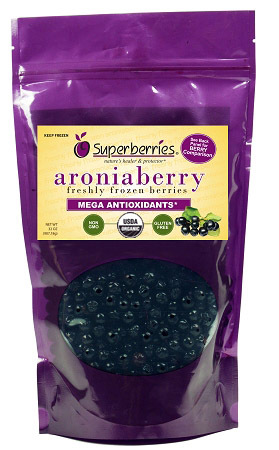 TIP: If your Aroniaberries are frozen, you don't need to thaw them first for this recipe.